There’s something about the word Ghee. It always makes me think of my daughter and back to the days where there were actually words she couldn’t pronounce. The days that she’d make me read books aloud to her until I thought my mouth would fall off, and she’d know them word for word. Ghee should really remind me of the divine, nutty smell, the silky texture, the heavenly mouthfeel. All of it. Instead, I think of Dr Suess. HA! Motherhood has ruined me – but, like, in a good way. K, but what is it? Ghee is simply clarified unsalted butter. It’s taking browned butter one step futher. You heat high quality butter until the milk solids turn brown and the whole kitchen smells like buttery, nutty heaven. Well, a whole litany of reasons, really – in no particular order. 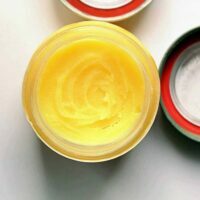 Ghee has a higher smoke point than butter, coconut oil, and olive oil! In fact, it’s got such a high smoke point it’s in the same category as some unhealthy oil options. Use ghee and kick the GMO corn, soy, canola etc oils to the curb! Ghee is rich in vitamin A, D, E, and K. We know from my Core Essentials review that vitamin A is integral in cell integrity and differentiation, and has strong anti-oxidant funtions to help protect our bodies from stress! Vitamin D works in conjunction with vitamin A and is especially important in the regulation of calcium metabolism and normal calcification within the body! The anti-oxidant effects of vitamin E help reduce the oxidation of lipid membranes and prevent the breakdown of nutrients by oxygen. Meanwhile, vitamin K is vital to our health by supporting healthy blood clotting and coagulation. It can help you lose weight?! Yeah, true. Healthy fats are part of a balanced diet and can help you lose weight. Ghee is rich in conjugated lineolic acid, or CLA, and in preliminary studies, CLA has shown positive results towards reducin appetite levels and weight loss. Oh. Did I mention it tastes and smells AMAAAAZING! Gotta get every drop of that golden goodness!!! How do I get it?! Well, you can buy it! Amazon stocks it. Or, if you’ve been spending too much time with me, you can make it! Coarsley chop the butter into chunks and place into a large, heavy bottomed pot or the pot of your pressure cooker. Heat butter over medium heat, or saute setting for your pressure cooker, stirring regularly until you notice a thick white foam and a slight simmer, at this point, reduce temperature to medium low. Continue stirring regularly while the butter simmers - taking notice of the colour change and change in foam. The foam will disappear, and come back. Once it returns, it's time to strain! Allow the ghee to cool for a few minutes, meanwhile, line a mesh strainer with cheesecloth and prepare your containers. I use mason jars. Carefully pour hot liquid gold through the strainer, into your container of choice! Allow to cool at room temperature until fully cool before covering. 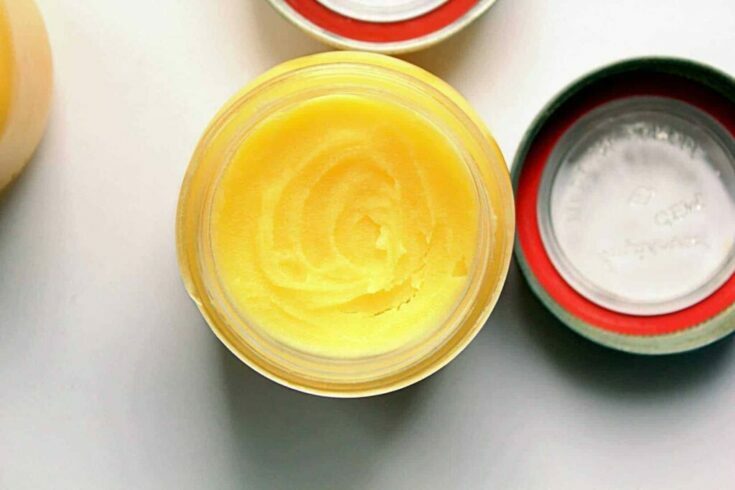 Ghee can be store on the counter in a sealed container for 3 months, and much longer in the fridge! I usually make a 4 cup batch and keep one jar on the counter and one in the fridge till the first one is done! Previous Post: « Celebrate Creamsicle Day With These 12 Awesome Recipes!